The Active Sensor Kits A2-P, A3-P and A3-A can be connected to a Windows operated PC using a provided TAM Dashboard Software. 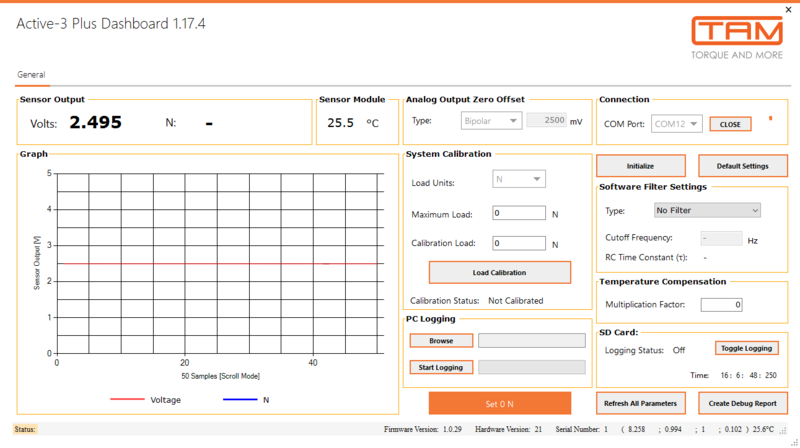 The TAM Dashboard Software for the Professional Sensor Kits A2-P and A3-P can be used to report in real-time Torque and Bending measurement in numerical and graphical form, and to apply comprehensive sensor system optimisation. The TAM Dashboard Software for the A3-A is used for Sensor System optimisation and register settings only. The TAM Dashboard Software is included in the shipment of the professional Sensor Kits: A3-P and A2-P, and a reduced Dashboard Software is also included in the A3-A Sensor Kit. The A3-L is an easy-to-use Evaluation Sensor System and does not require a dashboard function.